The Buffalo Eraser Sponge works with JUST water which makes it quick and easy to use. No fancy soaps or harsh chemicals needed! The Buffalo Eraser Sponge cleans most surfaces with just water. The sponge side of the Buffalo Eraser Sponge is an extremely fine micro-abrasive foam. 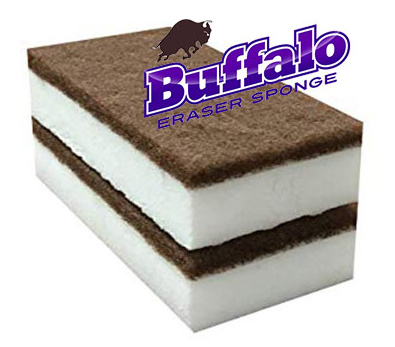 This quality greatly enhances the cleaning and preparation characteristics of the Buffalo Eraser Sponge. The woolly side of the sponge is a non-abrasive nylon and can be used a like a standard nylon scrub. The sponge side MUST BE DAMPENED before use. Always test on a hidden area prior to use because both sides of the Buffalo Eraser Sponge can scratch, mar, or dull some surfaces. Do not let your kids (or pets) play with or use Buffalo Eraser Sponges! They can be swallowed and can cause rashes and burns if rubbed against the skin. After using, wipe up any remaining residue. Don't eat, lick or taste. Don't rub on your person. The superfine foam can cause abrasions. Do not use on chrome, glossy automobile paint or high gloss surfaces. Use lightly on painted walls. Melamine is a micro-abrasive and can scratch some surfaces. Always test on a hidden area prior to use. Use caution on leather and other dyed surfaces. Do not use the melamine side (white side) of the Buffalo Eraser Sponge on uneven or rough surface. This could cause the sponge to shred.